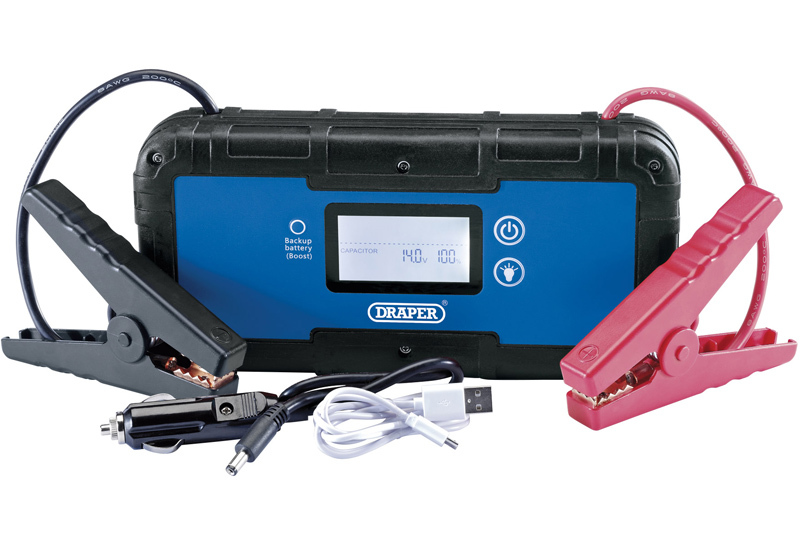 Capacitor Jump Starter from Draper Tools. The easy-to-use jump starter from Draper Tools can be fully primed in approximately two minutes. According to the company, it’s compact and lightweight, yet delivers the same result as a traditional bulky charger. It’s fitted with advanced capacitor technology that enables the starter to jump-start vehicles up to 6L petrol and 3L diesel. Unlike most on the market, this charger is fitted with an internal battery that energises the inbuilt capacitors, enabling it to start vehicles even when the vehicle’s battery is completely flat. The unit can be recharged by 12V DC and USB charging cables (supplied). The LED digital display indicates battery voltage, capacitor charge, lithium battery charge, reverse polarity and function selection. It is fitted with a convenient inbuilt torch with three lighting functions and wrapped in a non-slip protective rubber case.